Primeone is completely dedicated towards matching the clients with the right candidates for full time opportunities. 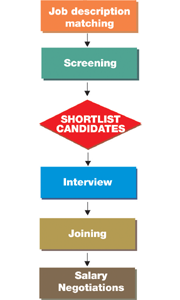 We arrange recruitment drives for the client based on the set of requirements provided by them. Over the time, we have also maintained a huge database of qualified and top class prospects, which can be used to find the right candidate immediately. Primeone provides staffing solutions for all levels of the corporate hierarchy. With us, you can completely forget all your staffing woes. Just give us the JD and sit back as we forward you eligible resumes and help you further by interviewing and hiring the candidates of your choice. We work both independently as well as with the HR team of our clients. The choice is yours. If you want to be a part of the decision, you are most welcome or you can simply watch us work. Our experience and knowledge in the manpower industry will enable us to face any future challenges in the coming years and we are confident that we gave enough people, resources and equipment to beat any challenges.